This is where I play (it’s not work when you enjoy it). 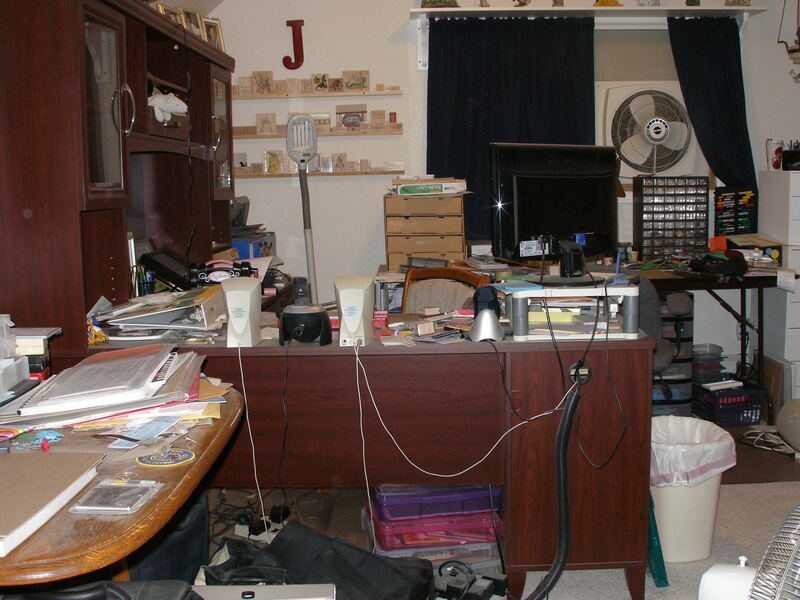 I know it’s messy but I seem to know where everything is. 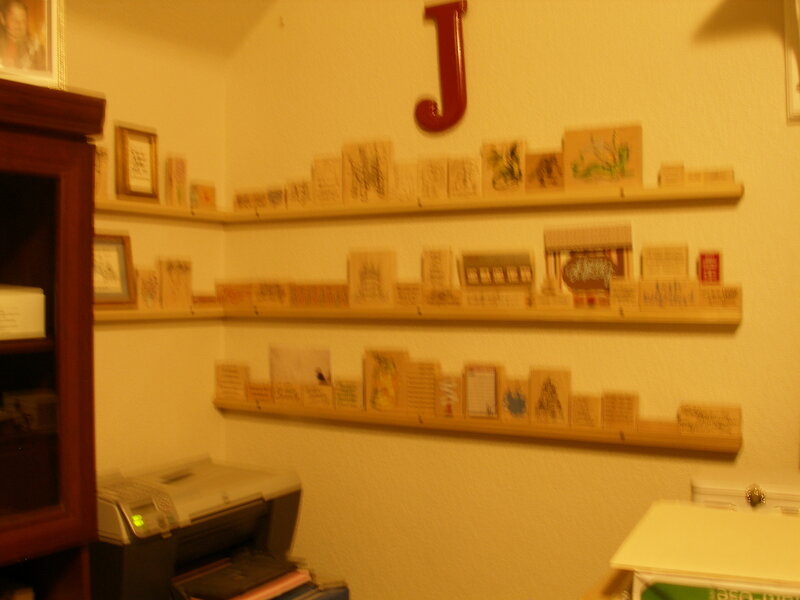 A friend of Jeff’s cut the boards & then Jeff put them up for my stamps. 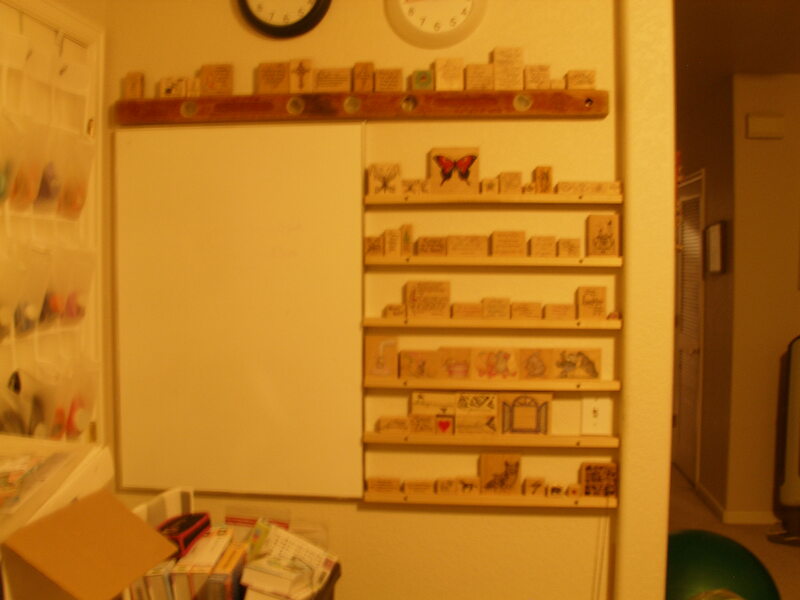 My clear stamps are in a binder & then I have holiday stamps put away by groups. A lot of my Stamp ‘N Up stamps are grouped together in their cases. Main working area.I can explain. 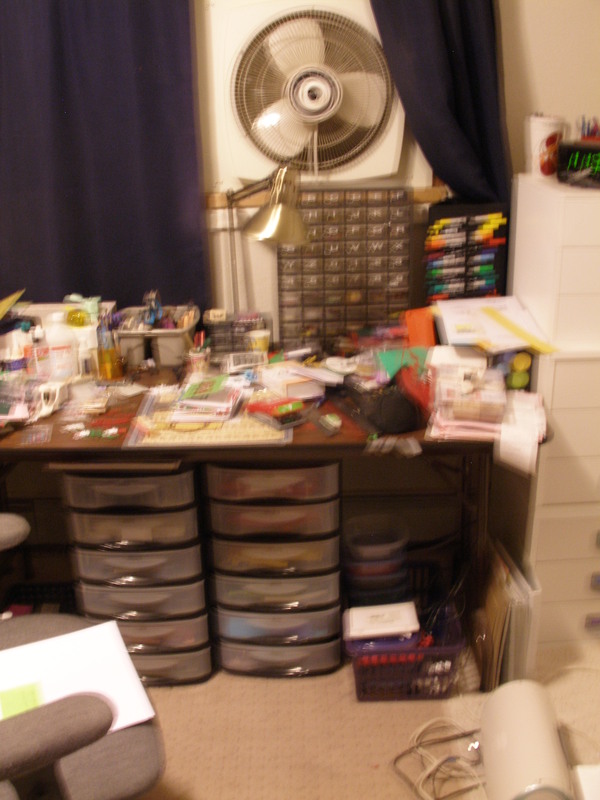 To the right in white are my 12×12 paper drawers divided by color. 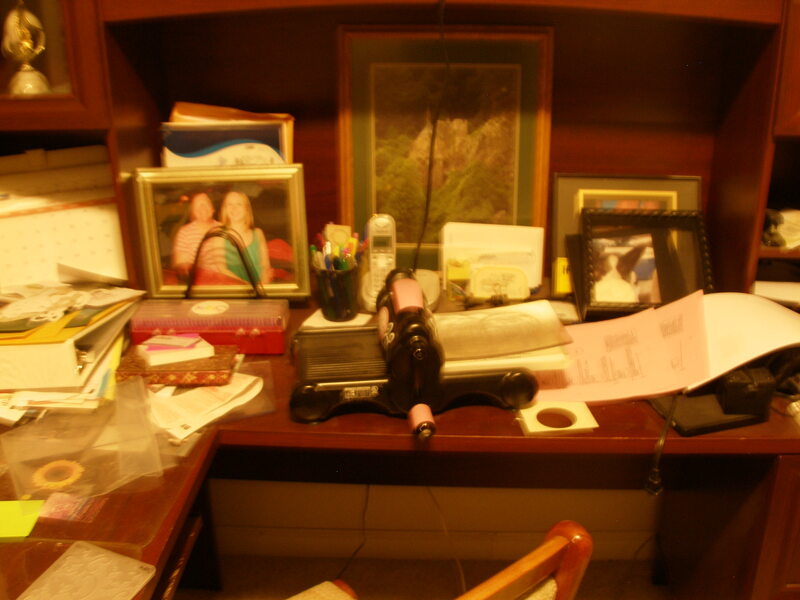 The black drawers under the table are for scrap papers also divided by color. I purchased at the local hardware store one of those gray nuts & bolts holders that I have labeled with the alphabet. Extra Letters & Numbers file. When I have left over letters I sort them in the right drawer. On the floor you can see my Cricut that I put on the table when in use. 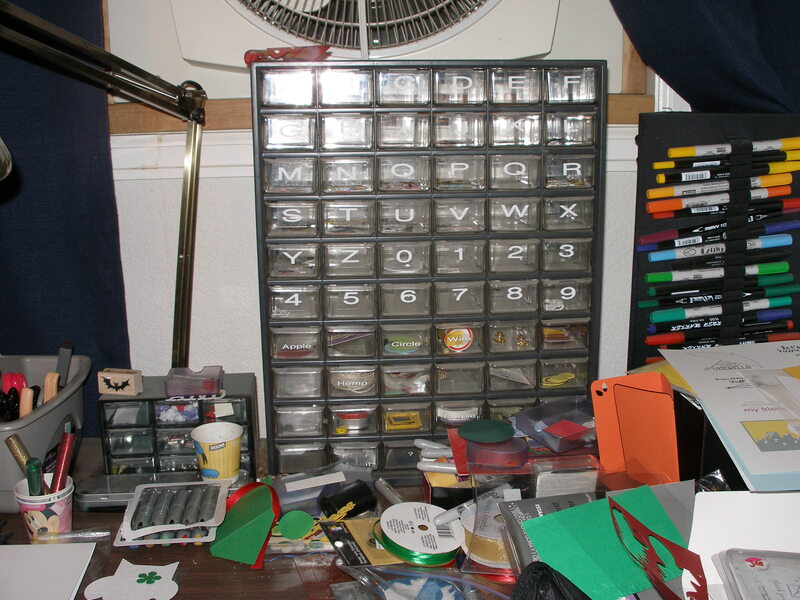 Also to the right of the scrap drawers is all my embossing things. I purchased ziplock containers that I keep different colors of embossing powders. 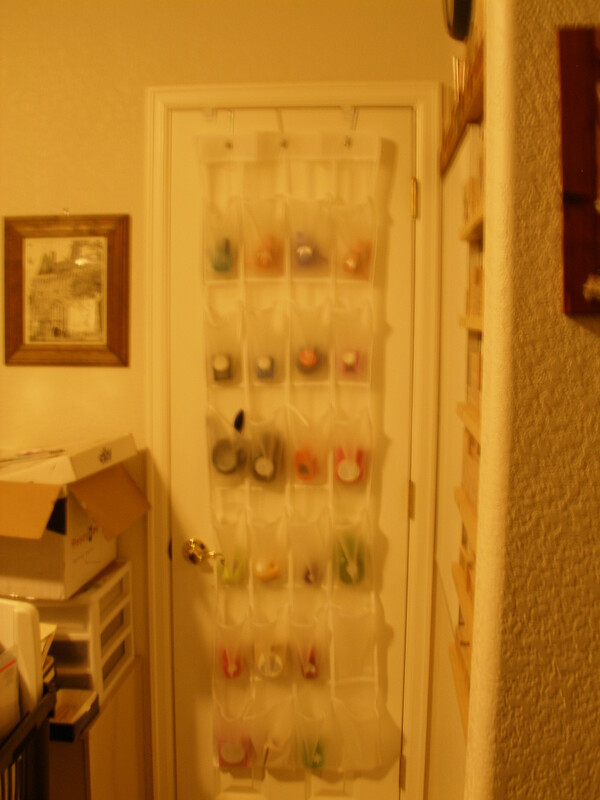 Store punchesI store some of my punches in a clear shoe holder that hangs on the door. The rest of my punches are in a fancy large box I found. Still others are filed away with seasons/holidays. My tools, tapes, glues, etc… are all kept in an Ikea 3 basket drawers that you can just see the top of in the bottom right of this picture. Well that’s most of my space. It’s a mess but it’s also my happy place. OMG what a delightful place! You had acquired an amazing collection of tools – I could get lost in here!! If you wanted to make a thank you note to send a friend how long would it take you??? I can make up a card in a day. Shorter if I’m inspired. My Mom collects elephants so any time I find something with an elephant I make them real fast. Today I was inspired because I bought a new die (but don’t tell anyone).